Tom Hanney, center, traveled to Mississippi to prepare for his new class, The Harmonica and the Blues. He spent time exploring a historical archive, researching material and listening to recorded performances by Sonny Boy Williamson and Robert Johnson. A new course being offered at RIT this spring blends a history of America’s most iconic music with an understanding of the tiny instrument that’s come to symbolize its sound. The Harmonica and the Blues, taught by Center for Multidisciplinary Studies senior lecturer and local musician Thomas Hanney, highlights the history of the harmonica. The special topics course also reflects his love of music as well as his approach to music—and education—from cultural, historical and technological perspectives. “I want the students to come away with an appreciation and an understanding of the great American art form of the blues, and the influence it has had on the world,” said Hanney, who plays harmonica in blues, swing and rock bands locally and has opened for blues legends such as Buddy Guy and Robert Cray. 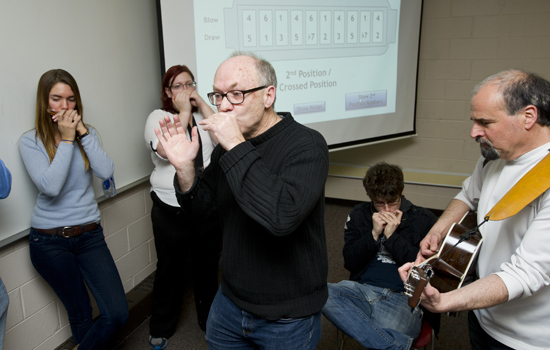 As RIT takes a more multidisciplinary approach to teaching, faculty such as Hanney are seeking out peers across campus to build courses like The Harmonica and the Blues. His new musical history course includes a talented ensemble from two colleges. Al Biles, professor in RIT’s School of Interactive Media and the Center for Media, Arts, Games, Interaction and Creativity (MAGIC) taught classes about the science of sound. Students also toured the new audio technology studio in the College of Applied Science and Technology with Mark Indelicato, associate professor of electrical, computer and telecom engineering technology. Like Hanney, both faculty are also talented musicians, Indelicato playing guitar, and Biles, the trumpet. Known for his jazz improvisation through live and computer-generated accompaniments, Biles explained how a spectrogram is used to visualize sound. A spectrogram provides graphic images of a sound’s frequency, intensity or duration. Understanding audio characteristics such as these can be used to identify and assess the quality of sound files. “This science of sound, it’s not my area of expertise, but that is where Mark and Al come in. I know these technologies exist, but I don’t understand the science behind it. One thing teaching does is make you aware of what you don’t know,” said Hanney with a laugh. The class provided him the chance to learn, along with his students, about the complexity of music and technologies. “The students do not have to be great musicians to be in the class. In fact, they don’t need any music background; this is not a performance class. “But they do learn how to play the harmonica. It’s a way to understand the music. They will experience what a ‘blue’ note is because they can create one on the harmonica,” he said, describing a sound that’s soulful, plaintive and bittersweet—and distinctive. Watch a webinar on The Harmonica and the Blues at www.rit.edu/alumni/harmonica.